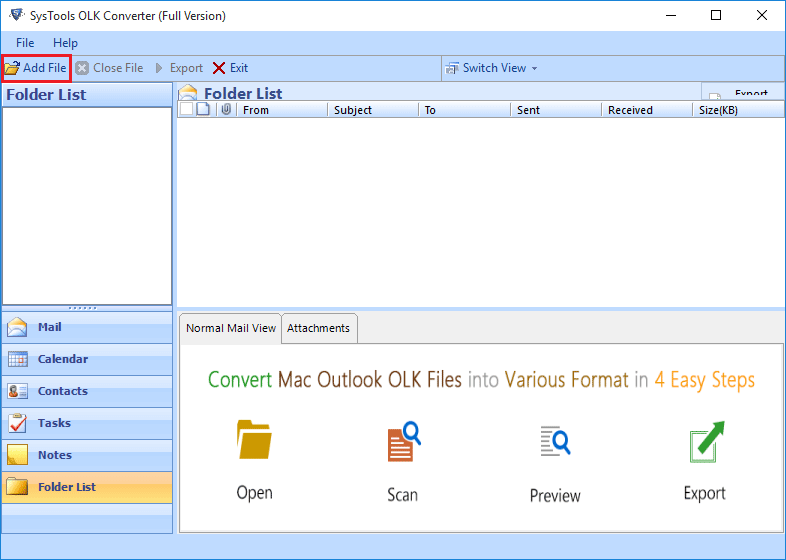 The OLK converter tool is a standalone software, which can successfully convert the OLK files to PST with or without installing Microsoft Outlook application. As the OLK files are application readers, this makes the users unable to open them. Hence, with this amazing tool, now it becomes easy to convert the OLK15 files to the desired file format, including PST format. Outlook Mac yields an OLK14message file that represents each message. This means the number of OLK14 files is equivalent to the messages that are exchanged to Outlook Mac account. With the help of OLK14 converter tool, one can easily convert multiple OLK files in one go. Additionally, it does not pose any restriction to the OLK files to convert into HTML format. This OLK15 converter is one such utility that is developed by the best technocrats to convert OLK to EML, MBOX, PST, PDF, HTML, MSG and vCard, ICS file formats. As a result, it provides customized filter to export selective messages i.e. Date-based filter, which is applicable on the OLK15Message, OLK14messages. For that, simply specify the date range in “To” and “From” fields. This OLK converter is an innovative tool that is designed with powerful algorithms by the experts. 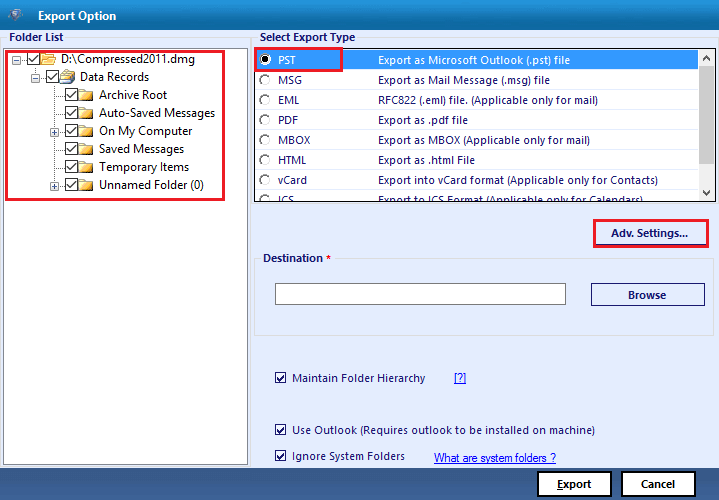 Therefore, it offers two advanced categories while converting the OLK file, which is available for Mails and Calendars. This added feature exhibits users to choose the selective options based on the category to conveniently export OLK14 files to PST, PDF, HTML, EML, MBOX, and MSG format. The OLK converter tool ensures to provide a simplified interface during the conversion process. Hence, while saving OLK15 files to the desired format, the software allows applying the different naming pattern that is applied to the resultant files. It includes Subject, Subject+Date(DD-MM-YY) and many other options. Even if, there are bulk OLK files, applying any of these patterns are reflected on all files. This OLK15 converter tool is packed with unlimited features to provide a friendly approach to all the end users. As a result, this converter tool can seamlessly export bulk OLK files to an Office 365 account. For users who need to move the OLK file, which includes emails, contacts, calendars, etc to Outlook 365 then simply download this efficient tool on your Windows system. Now it becomes easy for users to import the OLK files to different MBOX supporting applications like Thunderbird, Apple Mail, Eudora, Entourage, etc. To process the same, one can effectively make use of this overwhelming tool, which efficiently works to export the OLK file that contains emails, contacts, calendars, notes and other data items to MBOX format. PDF being a secure file format, a user can restrict others from modifying their precious data. 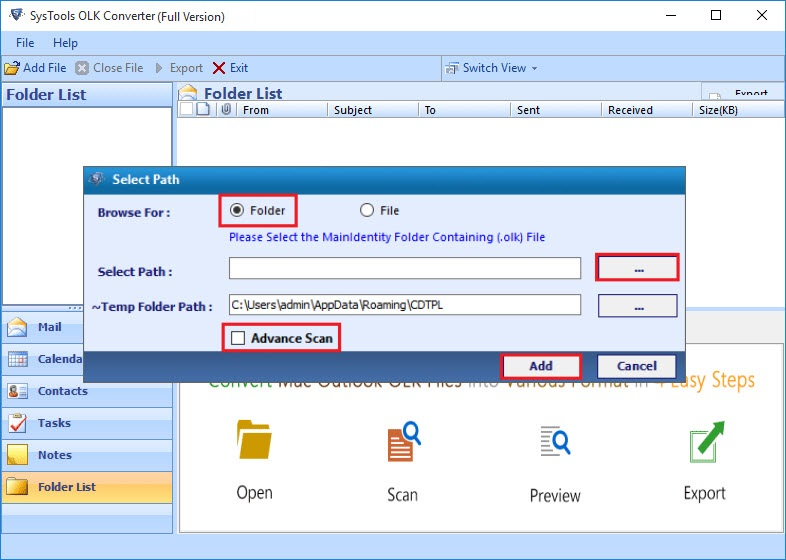 Moreover, with the help of the OLK converter tool, one can smoothly convert the OLK emails along with its attributes to a portable document file format (PDF). After converting the OLK file to PDF format, a user can apply security settings to the converted PDF file. Step 4: Export OLK to PST, MSG, MBOX, etc. Does OLK15 converter tool allow to convert OLK contacts to VCF format? Yes, the tool provides a specified vCard option, thus it is possible to convert the OLK file to VCF file format. What is the maximum number of OLK files allowed to convert into MBOX? There is no any limit to convert the OLK14 files to MBOX format. Therefore, a user can export unlimited OLK files irrespective of its file size to the destined file format. What is the amount of time required to convert the large-sized OLK file? The OLK14 converter tool will take the least time to convert the OLK files. Can I convert selective OLK14message files to PDF format? Yes, the OLK converter tool offers a Date-based filter, which is a customized filter that can be applied to export selective data to PDF format. Can this OLK14 converter utility be installed on Windows 8 version? Yes, this software can be easily downloaded on Windows XP, Vista, 7, 8,8.1 and 10 versions. 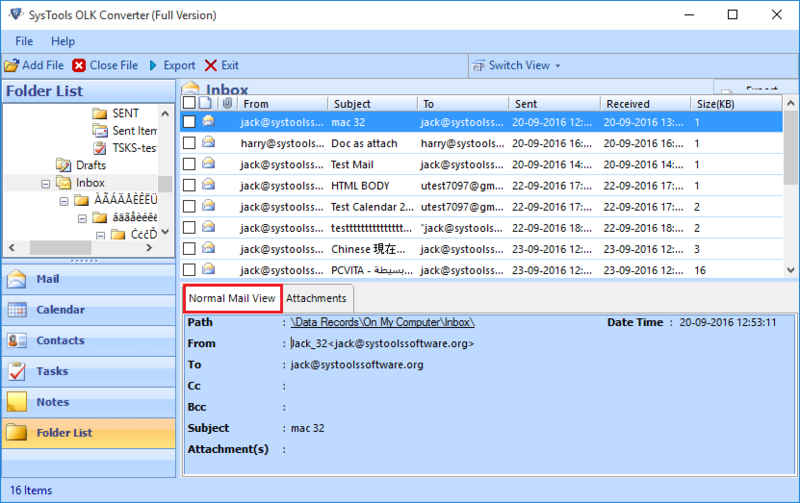 Does the tool require Outlook to be installed to convert OLK into PST format? The OLK converter tool being an independent utility, it can easily convert OLK file to PST format with or without Outlook installation. "The OLK Converter Software works really well and was able to handle such any Outlook OLK file exceptionally well. A truly enterprise level tool and is recommended to anyone who wishes to convert their OLK files to PDF & PST format without any extra efforts." "Nicely developed OLK Converter tool! Helped me to export all my OLK items into PST files, now I can use MS Outlook for managing my all folder items. All data converted in original format without getting corrupted & without loss of associated attachments." 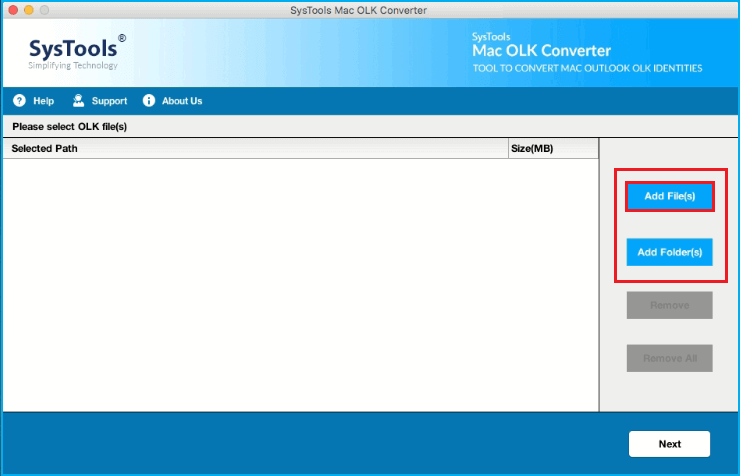 The Mac OLK Converter tool allows to import OLK15 / OLK14Message to PST, EML, and MSG file format. It is designed to extract and export all items i.e., emails, contacts, and calendar from OLK file to Outlook PST, EML and MSG. It is capable enough to transfer OLK File as original format while converting olk14message to PST, EML & MSG File. The OLK14message converter tool offers a smart feature to add and export multiple .olk15 / .olk14 files at a time. There is no file size limitation imposed in the OLK15message converter tool so users can browse the unlimited number of files easily. One can even use 'Add Folder' option to browse the bulk number of OLK files. Mac OLK15 file Converter provides a selective migration in which message will be saved in a certain date range to PST, EML, MSG format. However, users only need to mention the passage of time (‘From’ to ‘To’) and then, migrator will filter each message from browsed .olk files automatically. With the help of Mac OLK Converter, one can easily save the exported OLK14Message & Olk15Message file to EML or MSG with any desirable naming format. It also offers different naming options to save a file with the desired name. It will allow users to convert OLK to MSG, EML format in an efficient way. 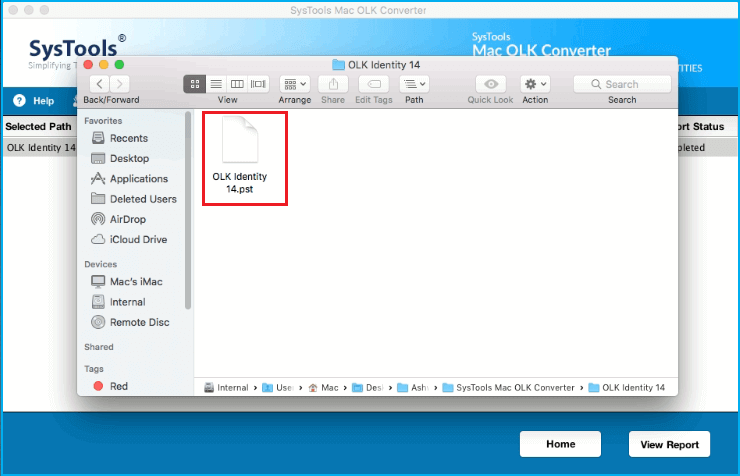 Mac OLK converter software guarantees that it will maintain .olk folder structure throughout the conversion process. It means that this tool will not affect the folder hierarchy when files can be exported within it. Before and after migration, the file structure remains the same throughout the entire procedure. This software is incorporated with user-friendly, simple and interactive design. It also provides the most understandable layout that helps to perform the OLK conversion accurately. It is compatible with latest Mac editions such as OS X Yosemite Version 10.10.4 & 10.10.5, Mac OS Sierra Version 10.12.3. 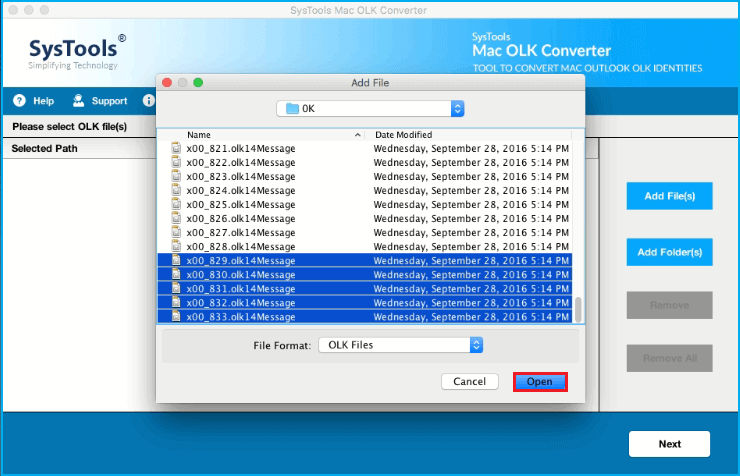 Demo version of Mac OLK Converter Software will Export only 25 Items per Folder from OLK14Message to PST, MSG, and EML on Mac OS Platform. Is it possible to export contacts of OLK file to PST format using this product? Yes, for doing this task, you have to choose OLK files and enables the contacts folder checkbox. It will help to move OLK file address book to PST file. 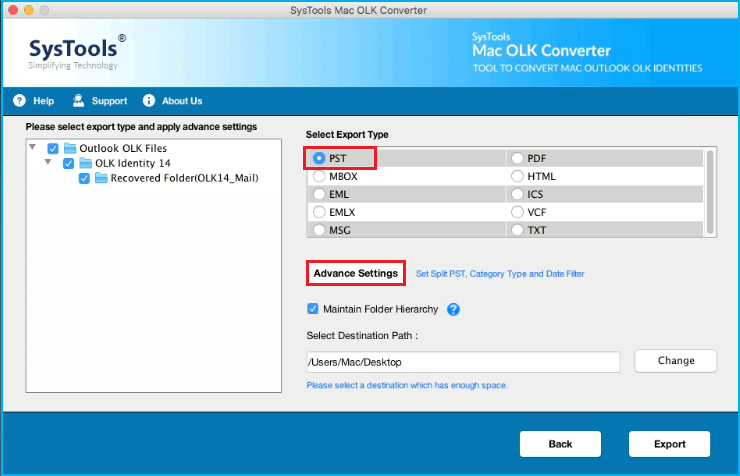 Does your OLK Converter tool works on Mac platform throughout the procedure? Yes, Of Course, this converter tool works on Mac OX X 10.10 and its above versions to migrate olk14message to Pst, Msg or EML file. Is there any file size limitation while converting olk14message to EML or MSG file format? No, there is no file size restriction imposed in Mac OLK converter tool. Thus, one can export any size of OLK file. Will this Mac OLK Converter tool export OLK files with a specific date range? Yes, our software offers "Date Filter" option which allows a user to select those emails that fall within a particular date range. "Yesterday I was stuck with numerous of OLK14 messages but there is no way to open them, at that time I thought I have lost all my Mac emails. Luckily, I found this OLK file converter tool that helped me to migrate olk14message files to EML format. Beside this, Date-based email Filter is also very nice feature." "I am having Mac platform and I tried to move my all OLK files on Mac machine. Thus, I opted for Mac OLK Converter application, which allows me to export OLK14 messages into EML format, that was accessible on Mac OS easily. Thanks to the development team for creating a wonderful software." "Mac OLK Converter saved a lot of efforts and time in exporting emails from olk15message to PST format. I must say it is one of the best software that can transfer all items like emails, contacts, calendars to PST format. Moreover, there is no file size limit during conversion procedure. I really appreciate the hard work of development team who initiated this amazing tool!"